We have rooms available for this weekend and there are lots of things to do in the area. Local comedians will perform tonight at Market Cross Pub - and there is no cover charge. Market Cross Pub brews its own beer and the seasonal specialty beers on tap right now are Midsummer Knight Wheat Ale and Bessie's Best Brown Ale. Come and enjoy some local comedy and some local brew! More live entertainment is available for you enjoy at Roundtop Mountain Resort. This weekend Robert Bobby will perform on Friday night and Copper Sky will provide the entertainment on Saturday night. Enjoy dinner at the Mountain View Restaurant and entertainment in view of the mountain. Remember our special rates when you experience the zip lines, OGO balls, or Canopy Crawl. 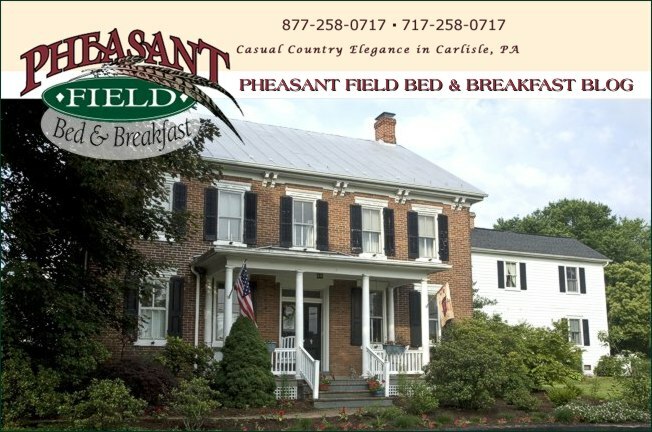 You don't need a special reason to visit Pheasant Field Bed & Breakfast! Come to relax, reconnect, and rejuvenate. Enjoy some quiet bird watching or allow a butterfly to land on your shoulder. It's time for a short getaway before the busy fall season arrives.